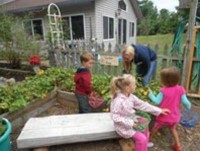 After attending a Nature Explore Workshop at the MI AEYC Conference in 2011, owner/teacher of Teddy Bear Daycare and Preschool, Beth Fryer came away with a multitude of ideas on how to remodel her great existing outdoor area into an amazing natural outdoor classroom. Plans and ideas were shared with her husband and families and the interest just grew. 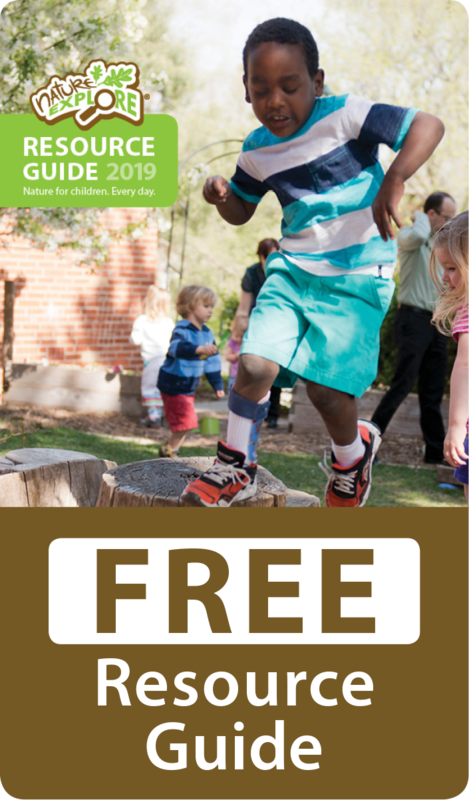 The renovations began when parents and children began designing and working on a beautiful walking path consisting of painted rocks, natural rocks, and diamond dust. The families brought in donations of flowering plants and grasses and the children helped to line the path with painted stones that their parents had helped them decorate with paint. 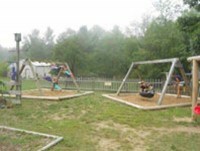 Work continued on weekends and parents pitched in to help during weekday evenings. The children were the true architects. 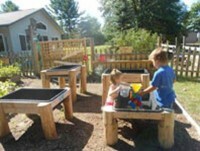 By observing their play, the classroom was truly designed around their interests and suggestions. 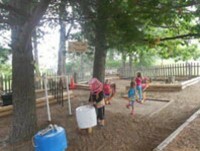 Each area was named by listening to their conversations and watching the way the children used the space. Lovely, large Oak, Maple, and White Pine shade most of the 7000 square feet of outdoor classroom. The space is very large, very interesting and very engaging. 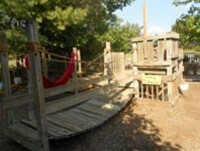 Plus, there are an additional five acres of woods to explore right next to the outdoor classroom. 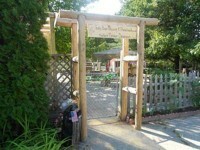 The children have several flower beds, vegetable gardens and beds of native plants that they help to care for. 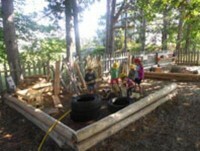 Straw bales have been placed in the Gathering Area for seating and there are hollow and large logs and tree cookies to walk and climb on. 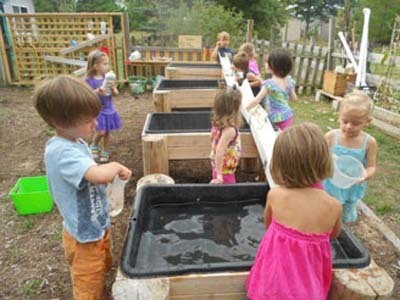 There is an abundance of wonderful natural elements to investigate, including a chicken coop where children may feed and watch chickens. 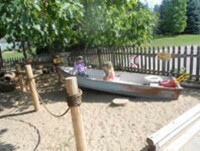 With a surrounding area of forests and lakes, a rowboat was added for dramatic play fun. The children can climb into the boat, take fishing poles, life vests and a cooler with them and go on a grand adventure.